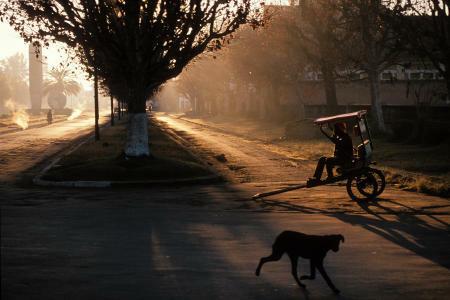 A rickshaw operator waits for customers at sunrise in Antsirabe, Madagascar. 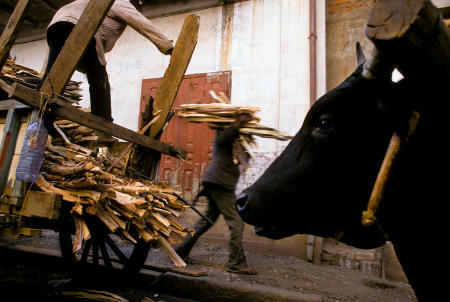 Wood, the main source for heat and cooking, is unloaded in Antsirabe, Madagascar. 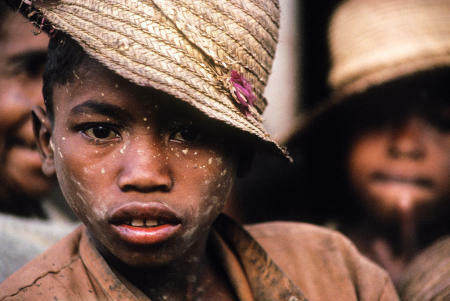 A Betsileo youth fresh from the rice paddies, has dried mud speckles on his face in remote Ambozatany. 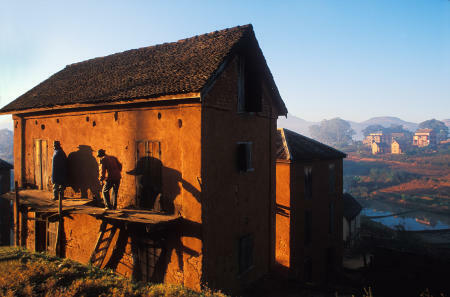 Betsileo villagers on Madagascar's High Plateau, stand on the second story deck of their mud brick home. 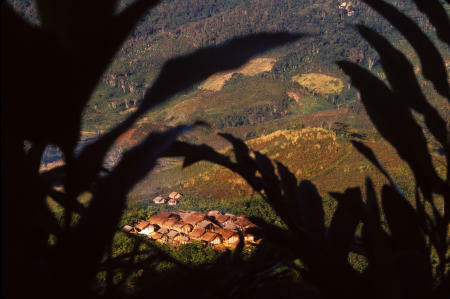 Thatched roofed bamboo huts in the village Namahoaka, are secluded in Madagascar's Southeastern Rainforest. 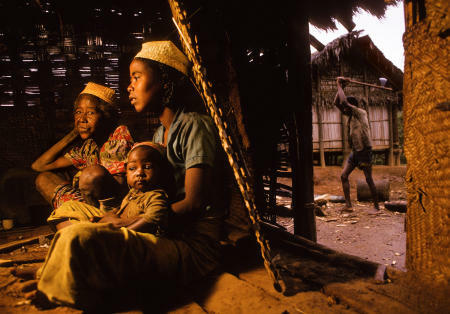 A Tanala family sits by the fire, as wood is cut outside, in remote village of Namahoaka in Madagascar. 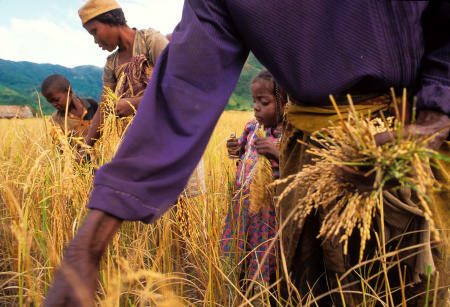 Three generations harvest paddy rice in the remote Madagascar village of Namahoaka. 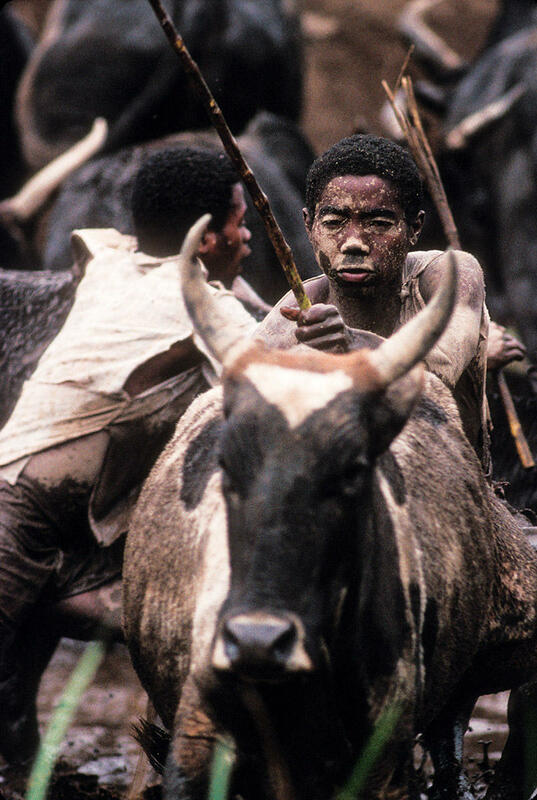 Young men herd zebu cattle around the rice fields so their hooves break up the soil in preparation to plant. 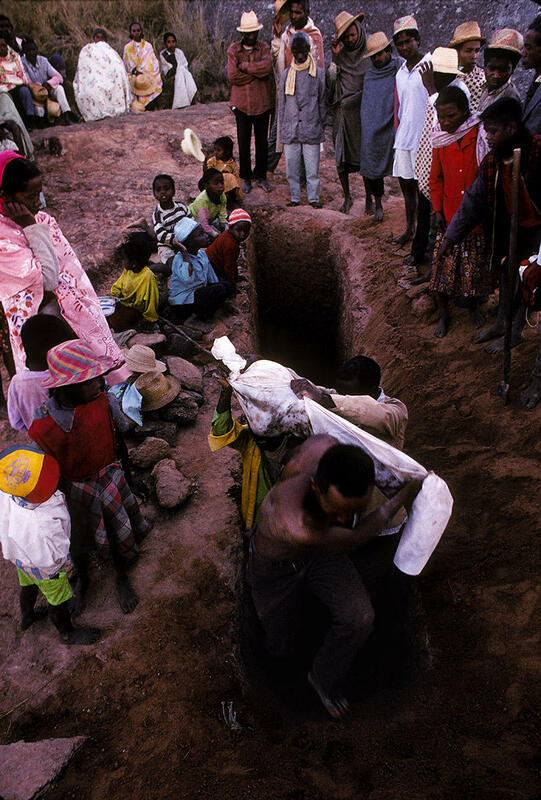 Betsileo villagers gather to worship the ancestors in a yearly ritual called Famadihana, which includes exhumation and rewrapping of remains in fresh shrouds. 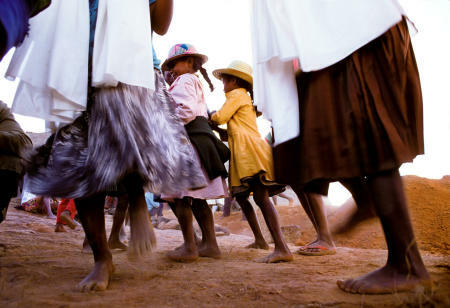 Some Malagasy worship the ancestors, believing all will be well in their lives if they honor and remember the ancestors. 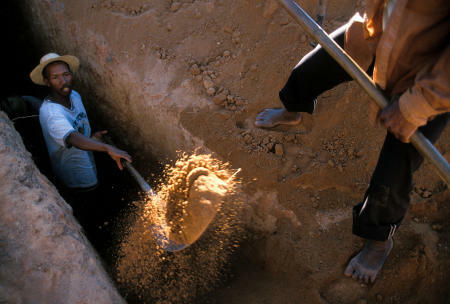 Betsileo villagers dig into the tomb entrance during Famadihana ritual, which includes exhumation and rewrapping of remains in fresh shrouds. 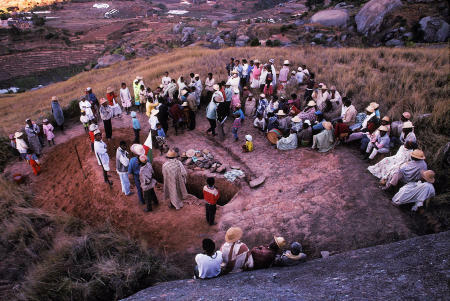 Some Malagasy worship the ancestors, believing all will be well in their lives if they honor and remember the ancestors. 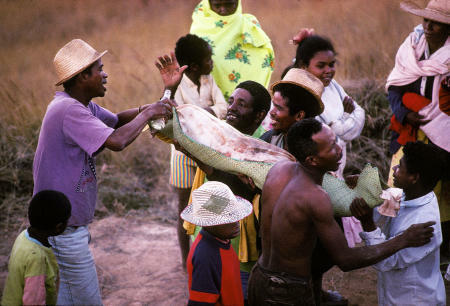 Betsileo villagers carry the remains from the tomb entrance during a Famadihana ritual, which includes exhumation and rewrapping of remains in fresh shrouds. Some Malagasy worship the ancestors, believing all will be well in their lives if they honor and remember the ancestors. Betsileo villagers share sugar cane rum with the remains of an ancestor during a Famadihana ritual, which includes exhumation and rewrapping of remains in fresh shrouds. Some Malagasy worship the ancestors, believing all will be well in their lives if they honor and remember the ancestors. The mother of the deceased dances during Famadihana ritual, which includes exhumation and rewrapping of remains in fresh shrouds. Some Malagasy worship the ancestors, believing all will be well in their lives if they honor and remember the ancestors. Betsileo villagers dance during a Famadihana ritual, which includes exhumation and rewrapping of remains in fresh shrouds. Some Malagasy worship the ancestors, believing all will be well in their lives if they honor and remember the ancestors. 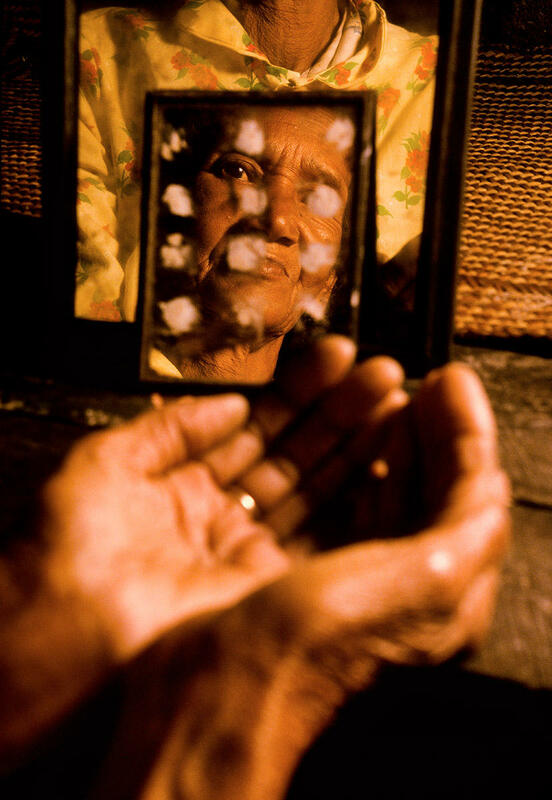 A Malagasy traditional healer looks into a mirror used to communicate with ancestors in the afterlife, to seek their wisdom. 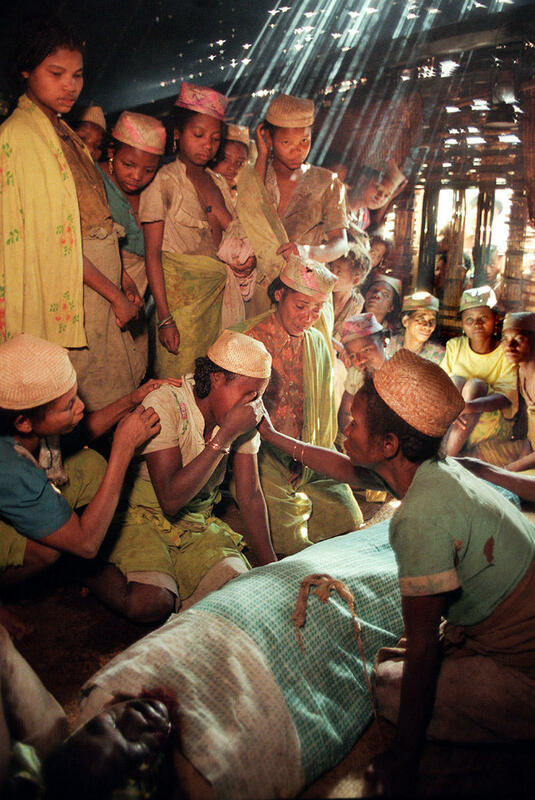 A Malagasy child is treated by a traditional healer for a condition called Taitaitra. Actually growth spasms, parents believe the crying is caused by evil spirits attaching themselves to infants. 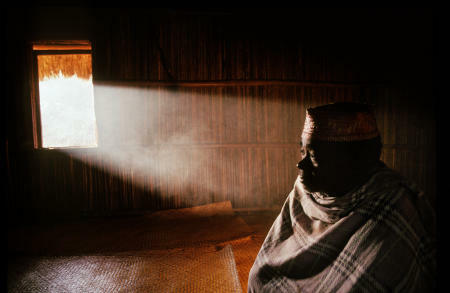 Namahoaka village leader, or Mpanzaka, Zafy Romain sits inside the Trano Be, or Big House, as smoke highlighted by morning light emerges through the window. 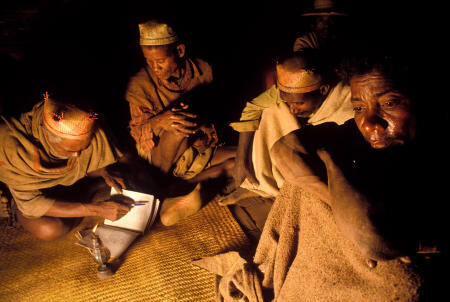 Namahoaka village elders notate offerings from mourning relatives during a funeral in the remote Madagascar village. A woman is consoled while mourning near the body of a 17 year-old boy who died of alcohol poisoning in the remote Madagascar village of Namahoaka. A woman appears to be possessed, during a funeral ritual in which they believe another ancestor is using the living body as a medium, to visit from the afterlife and pay respects to the recently deceased. A mourner places his hat between his feet in respect, as the body is brought to the tomb during a funeral. A skeleton is exposed in an open cliffside tomb in Madagascar's Isalo National Park in the southwest. 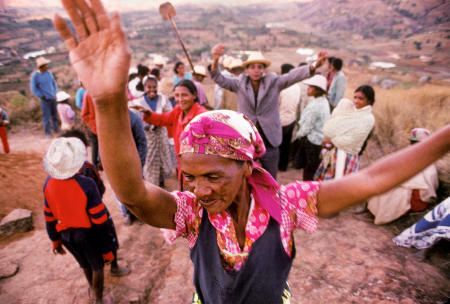 Betsileo villagers celebrate with music at the end of the harvest season in the Madagascar village of Ambozatany. A small bamboo raft, serving as the Namahoaka village ferry, is paddled across the river to pick up passengers.